American DJ's Versatile Mega 24PRO LED Color Wash Bar is Perfect for Dance Floors, Uplighting, Stage Shows and More! Wherever a bright wash of color is needed -- whether on a disco dance floor or uplighting at a formal event -- American DJ’s Mega 24PRO is the “magic stick” that can do the job. 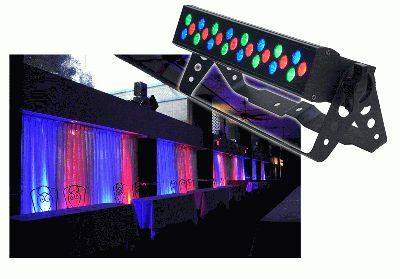 A compact 16” RGB color bar with 24 brilliant 1-watt LEDs (8 each red, green and blue), the Mega 24PRO not only changes colors like a chameleon, it can adapt to different uses -- from uplighting walls and ceilings, to overhead illumination -- thanks to its dual-purpose bracket and many professional features and user options. Producing a 10° vertical x 40° beam angle that’s perfect for wall washing, the Mega 24PRO features DMX or manual control, RGB color mixing, 32 built-in color macros, a color strobe effect and 0-100% electronic dimming. Its multitude of features, along with 6 operational modes, give the Mega 24PRO the ability to create whatever ambience or color effects are needed, making it ideal for theatrical productions, nightclubs, special effects installations, party venues, DJs, mobile entertainers and more. Easy-to-use and affordable, this versatile LED color bar is sure become a workhorse in any lighting user’s arsenal. One example of this flexible design is the Mega 24PRO’s double bracket. This handy device allows the unit to be set on a floor to shine a wash of light upward, as well as mounted on a ceiling or truss to illuminate dance floors and performers from above like a traditional club or stage light. Easy to operate, yet loaded with professional features, the Mega 24PRO is sure to be a favorite of beginners and long-time pros alike – another example of its versatility. Users can program their own customized light shows using a DMX-512 controller, or simply site back and let the unit run through its exciting built-in programs and color macros. Altogether, the Mega 24PRO can be operated in 6 different modes: Manual Color Mode; Color Change Mode; Color Fade Mode; Auto (Program Run) Mode; Sound Active Mode; and DMX-512 Mode. For even more control options, when using DMX there are 6 different channel modes to choose from: 3, 6 7, 10 12 o 16 channel modes. A 3-button LCD display on the rear panel makes it easy to scroll through the DMX menu. Multiple Mega 24PRO’s can be linked together via 3-pin XLR cables, for color washing larger spaces and venues. Not only is the Mega 24PRO versatile; thanks to its long-life LED lamps and no moving parts, it’s also virtually maintenance-free. There are no gears or motors to break down, and its LEDs are rated for 50,000 hours of use. That means this unit can run 24 hours a day for over 2,000 days before the LED bulbs would need replacing! An additional benefit of LED lighting is that it does not generate nearly as much heat as traditional halogen light fixtures, so there are no duty cycles, and the temperature is more comfortable on the stage or dance floor. The Mega 24PRO is economical to run, too – it has only a 40W power draw, costing just pennies per use. The sleek, aluminum housing of the Mega 24PRO makes it lightweight -- just 6.5 lbs., 2.92 kg. -- yet durable to withstand the rigors of transport. Combined with its compact size (16”L x 7.5”W x 2.8”H/405x190x71mm) it’s a truly portable unit, perfect for mobile use. The MSRP of the Mega 24PRO is $419.95.